In a mixing bowl, toss together the pork, oregano, rosemary, cumin and garlic and set the bowl aside. Meanwhile, make the peppers and onions: Heat 2 tablespoons of the canola oil in a large skillet over medium-high heat. Add the peppers and onions and cook, stirring occasionally, until they begin to caramelize, 8 minutes. Season with salt and pepper; set them aside on a plate. Pour the remaining 2 tablespoons of oil into the large skillet and turn the heat up to high. When the oil begins to smoke, add in the pork and spread it out into 1 layer. Without stirring, let it cook and develop a deep brown color, about 2 minutes. Then stir the pork, season with salt and pepper, and then add the peppers and onions back into the pan. Toss the pork and pepper mixture together and continue to cook until the pork is cooked through, about 2 minutes. Stir the parsley into the pork mixture. 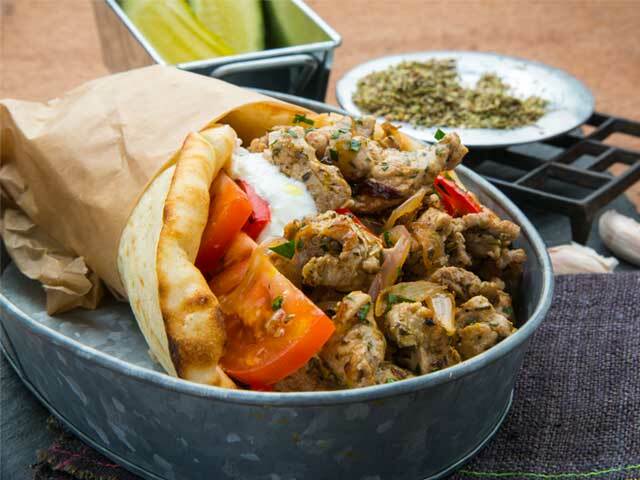 To assemble the gyros, divide the pork and pepper mixture between each pita, topping each gyro with 2 tomato halves, some of the lemon juice, and a tablespoon of yogurt. Wrap in wax paper and serve.